Artistic production in Japan is typically carried on in family workshops, whose methods and techniques are passed on in an apprenticeship system from father to son. Especially promising disciples may be adopted into a family in order to carry on a lineage, and conversely a family member or disciple may break away to found his own school. The identification of a lineage or school therefore involves: (1) the development and continuation through time of a recognizable style, and (2) the transmission of this style through the family system. In the workshop method of production, large statues were assembled by a team of specialists working under the overall direction of a master sculptor (busshi), who then applied the finishing touches and, often, "signed" the work by depositing a written record inside the statue itself. When a large statue is attributed to a particular sculptor, one can assume that preliminary work was done by assistants, but that the master would personally undertake the final carving. Among the many artistic lineages in Japanese history, the Kei school dominated production during the Kamakura period, receiving important religious and secular commissions in Nara, Kyoto, and elsewhere. The following are a few (by no means all) of the important sculptors of this school. Raijo founded the Nara school of busshi which ultimately became the Kei school. He was the second successor of the great Jocho (d. 1057). Raijo received a Buddhist title for his work at Kofuku-ji. After several generations Kokei (d. 1196? ), who was not related by blood to Raijo, became head of the school. At this time the Nara busshi were commissioned to restore the statues of Kofuku-ji and Todai-ji, which had been destroyed in the great fire of 1180. Unkei (1148?-1223), the son of Kokei, carried out restorations at Kofuku-ji and Todai-ji under the direction of his father. Following a stint in Eastern Japan, Unkei returned to Nara and assumed the leadership of the Nara busshi in 1195, shortly before the death of his father. He then moved the school to Kyoto, where he was appointed chief busshi of To-ji in 1198. Meanwhile, work at Todai-ji continued, where Unkei and Kaikei (see below) completed the colossal Nio of the Nandaimon in 1203. Unkei then turned his attention to Kofuku-ji and the statues, including Miroku, for its North Octagonal Hall (Hokuendo), which were completed between 1208 and 1212. In his later years he worked on commissions for the Kamakura Shogunate and various temples. Unkei's artistic style, which has been described by Mori as "heroic realism," celebrated the warrior ideal of the Kamakura rulers and set the standard for this period of Japanese sculpture. Kaikei was a uniquely talented disciple of Kokei (not related by blood), who worked alongside Unkei and Kokei in the restoration of Todai-ji, culminating with the Nio of the Great South Gate (1203). On the whole, however, his style was marked by a sweetness and beauty that contrasted with Unkei's heroism, while remaining faithful to the realism of the Kei school. A pious Buddhist, Kaikei excelled in the sculpting of Buddha images and was embraced by all ranks of society. He died, probably, sometime between 1223 and the end of that decade. Later Kamakura sculpture often is seen to contain a mixture of Kaikei's and Unkei's styles. Jokei was a disciple of the Kei school and contemporary of Unkei and Kaikei. He is known for several statues at Kofuku-ji, including Yuima (1196), Brahma (1202), and two Nio. Jokei was strongly influenced by Sung dynasty style, as can be seen in details of decoration and the expressiveness of his sculpted faces. Unkei had several sons, three of whom produced works which survive today. 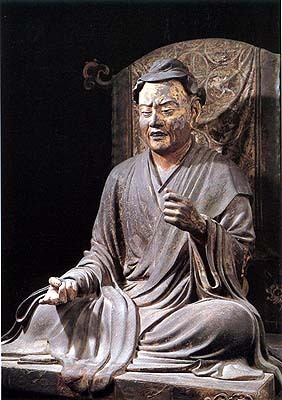 Tankei (1173-1256) sculpted the great Senju Kannon (1251-1254) at the Sanjusangendo, and nine of the thousand smaller Kannons in that hall; he may also have had a hand in the guardian statues there (Fujin, Raijin, and the 28 Followers of Kannon). Koben, Unkei's third son, created at least one (Ryutoki, 1215) of the marvellous pair of lantern-bearing demons at Kofuku-ji. Unkei's fourth son, Kosho, created the famous portrait statue of Kuya at Rokuhara Mitsu-ji, a portrait statue of Kukai at Todai-ji, and an Amida at Horyu-ji.